The purpose of Ocracoke Alive, Inc. is to enrich the Ocracoke Island community by encouraging and sponsoring cultural, artistic, educational, and environmental activities including the production of plays, musicals, musical events, exhibits, schools, workshops, and festivals. Ocracoke Alive’s Deepwater Theater and Music Hall is the island headquarters for Ocracoke Alive, and is the home venue for summertime show as well as the Skipjack Wilma Lee and small shop. 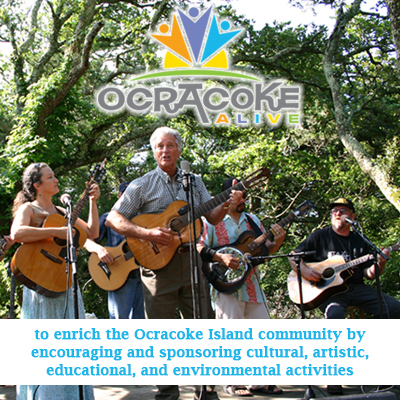 Ocracoke Alive also sponsors the annual Ocrafolk Festival in June. Ocracoke Alive is a private non-profit 501(c)3 registered in North Carolina.